This 90-minute webinar is designed to offer an overview of the work of academic developmental editing. It is aimed at two main audiences: current freelance editors who are looking to branch into developmental editing for academic clients and those who may be new to freelance editing but have some experience working with academic manuscripts. The webinar will cover the structure and process of academic publishing for both journal articles and books, including acquisitions, peer review, and the role of the freelance developmental editor in the publishing process. The webinar will also describe the scope of academic developmental editing and how it differs from and overlaps with other kinds of freelance editorial services, such as book proposal consultations, line editing, and copy editing. Finally, the webinar will summarize the stages of developmental editing (e.g. manuscript assessment, structural edits, etc.) and the most frequent issues that arise when working with academic clients. Webinar attendees will leave with an understanding of how they might integrate academic developmental editing into their freelance editing services. Ideally, they will leave the webinar eager for more practical training in the work and business of academic developmental editing and thus ready to enroll in the full EFA course. Instructor Laura Portwood-Stacer, PhD, runs Manuscript Works (manuscriptworks.com), which offers freelance developmental editing services and publication consulting to academic authors. She holds a PhD in Communication from the University of Southern California and is the author of Lifestyle Politics and Radical Activism (Bloomsbury Academic, 2013), a book based on her doctoral dissertation. She has extensive experience as a journal editor and peer reviewer, including a former post as co-editor of book reviews and commentary at the journal Feminist Media Studies. 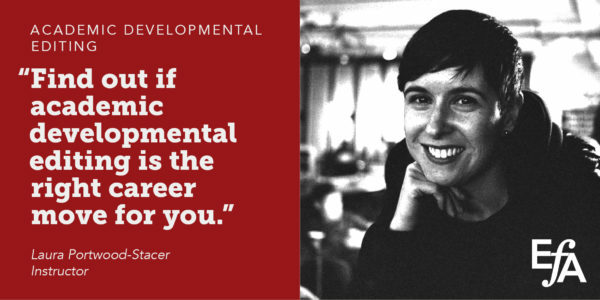 Before becoming a developmental editor, Laura taught courses in media studies at New York University and the University of Southern California.